Former Attorney General to speak in Exeter – do we need a new charter? The Devon & Somerset Law Society (DASLS) has announced a programme of events to celebrate the 800th anniversary of the sealing of Magna Carta. DASLS is acknowledged in the legal profession as one of the most active and innovative UK law societies and, in association with Exeter University and Exeter City Council, it is amongst the first to arrange events to commemorate a pivotal moment in British history. The Magna Carta (Great Charter) was signed on June 15 1215 at Runnymede in Surrey acknowledging certain fundamental rights and freedoms. The former Attorney General, the Right Honourable Dominic Grieve QC will be the guest speaker at the Mint Methodist Church Centre in Exeter on the evening of June 12 and will pose the question of whether we need a new Charter. He will follow a talk on the historical background to Magna Carta delivered by Professor Anthony Musson of the University of Exeter Law School. The Law School at Exeter University has also organized an essay competition on the same topic with prizes of £100 for the best 1000 words entry from university students and from ‘A’ level students. Other events include a 10K Exeter Magna Carta Legal Walk on Wednesday 3 June organised by the South West Legal Support Trust to raise funds for local good causes and the Legal Sunday Service at Exeter Cathedral on June 14 when the legal profession will process from the Corn Exchange to the Cathedral in full regalia. Exeter Cathedral is also providing an exhibition which includes a late facsimile of Magna Carta and some authentic 13th century documents. 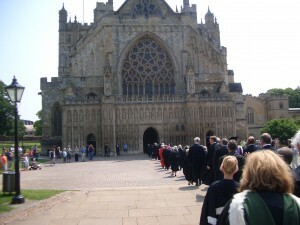 Sunday 14 June: Legal Sunday Service and procession of legal dignitaries. Procession commences 11.20 am followed by a Reception for all participants at the Corn Exchange, Exeter, hosted by the High Sheriff of Devon & DASLS.